I made this over the weekend at one of our local farmers’ markets for National Can-it-Forward Day. This no-sugar sweet treat is the perfect end to a summer’s night. Right out of the jar or used in the same fashion as you might use a fresh peach. The recipe makes a single quart jar for the fridge, but you can always double or triple and safely waterbath seal the jars to enjoy local peaches mid-winter. 1. Prepare your peaches by bringing a medium saucepan of water to a boil. Depending on peach size, this recipe will use approximately 1-1/4 lb small (~2”) peaches whole or 2lbs larger peaches halved and pitted (and maybe sectioned). For both sizes, drop peaches whole into boiling water and let them sit for as long as it takes for the water to return to a boil (~1-2 minutes). Drop peaches into an ice bath while you prepare your syrup. 2. Place 1/3 cup honey, 2 cups water and 2 Tbs lemon juice in a medium saucepan and bring to simmer over med-low heat. Remove pan from heat. 3. Peel small peaches (or peel, pit and halve larger peaches) dropping them directly into syrup saucepan as you go. Only peel as many as you can fit in the saucepan of syrup in a single layer. 4. [Optional] Place a slice of fresh ginger, a few strips of lemon zest or any dry spices like cloves or a cinnamon stick directly into one quart jar, or however many jars you are making. 6. 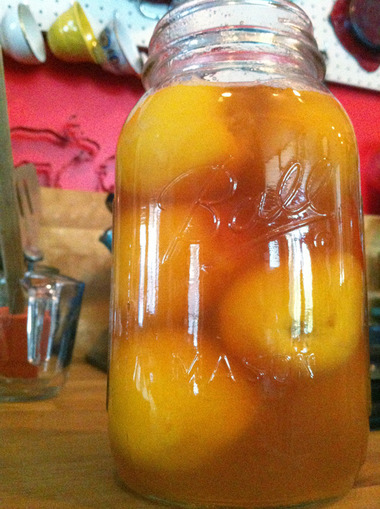 If waterbath canning is necessary, multiply syrup recipe by amount of peaches you have. Leave 1/2-inch headspace and process quart jars for 25 minutes, pints for 20 minutes. Otherwise, loosely cap jar, let sit on the counter to cool for an hour and then place in fridge where it will keep for about 3 months.